> What do you sell for cimbasso? > What is your cimbasso mouthpiece? > ' curious...What mouthpiece do you use on your cimbasso? Whatever works for any individual is great. Just fwiw...This is what I use. in my case - a "British" (small/bass trombone-size) shank. 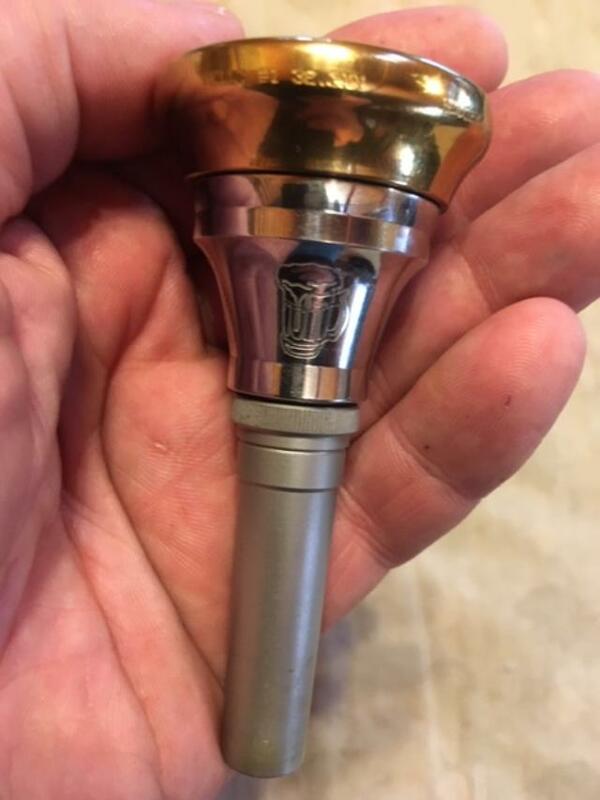 Obviously, an instrument with a standard shank receiver would need a standard shank mouthpiece. ...I use a gold-tone titanium-coated rim, because...it's pretty. *I use this same rim profile - but the largest opening (33.2mm) - when playing various tubas (with various cups/back-bores). Barely related question: does the Atlas-holding-up-the-world logo still exist on any products or did that end with the two piece Solo cup? Prior to the three-piece modular system, that engraving signified the #1 back-bore. Now that there are (not just two but) three Solo back-bores offered (in multiple shank sizes) - none of which are permanently affixed to the cups - that signification has become obsolete. Joe, have you tried a "traditional" contrabass trombone mouthpiece (something around 30mm)? Bob Kolada wrote: Joe, have you tried a "traditional" contrabass trombone mouthpiece (something around 30mm)? I own a fine one. I have other fairly regular uses for it, but can't make it work (to my satisfaction) with this instrument. I might guess that it would work well with a SLIDE contrabass trombone. As mine is pitched in F, everything is slightly scaled down (with the bore on reaching .689" just before the bell-attaching crook), but not as much as any of those production things that you mentioned.